USA-Canada hockey: Team Canada bests Team USA in 1–0 Olympic thriller. It wasn’t the result the Americans wanted, nor the game casual hockey fans had hoped for. But the Canadian men’s 1–0 victory over Team USA in Friday’s Olympic semifinal was a thing of order-restoring beauty for the sport’s faithful, and a hard-fought victory for a squad that had struggled to play the type of hockey expected from one of the most talented international teams ever assembled. It was also a reminder that for all the promise the Americans showed in rolling through the group stage, they’re still not (if they ever will be) on the level of their hockey-loving neighbors to the north. Canada’s victory wasn’t easy, but at times it looked that way. 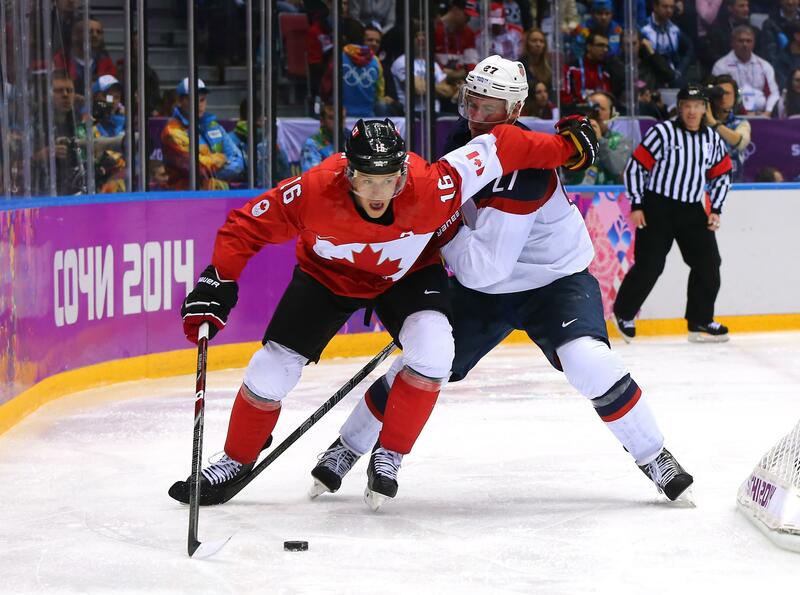 In the lead-up to the big game, the consensus was that the Americans were playing the best hockey of anyone in Sochi. They had beaten two world powers in Russia and the Czech Republic, and dominated two lesser teams in Slovenia and Slovakia. Canada, meanwhile, managed to look uncharacteristically shaky against a slate of teams that were outmatched on paper, if not on ice. The polite handwringing in the Great White North reached its peak on Wednesday during Canada’s 2–1 quarterfinal victory against a Latvian team with only one NHL-er. But overshadowed by Team Canada’s offensive struggles was its defensive prowess: They’d given up just three goals in four games, the fewest allowed by any team. And, as they showed Friday, it’s impossible to lose a game if your opponent never scores. On the other end of the rink, Canada largely controlled the pace of play, cycling the puck in the American zone when they had it and forechecking aggressively when they didn’t. Breakaways and slapshots find their way into the highlight reels, but it’s tip-ins and redirections that decide the victor in games like this one. Canada scored one of those goals that only a hockey fan could love in the second period when Jay Bouwmeester threw the puck in front of the net and Jamie Benn managed to get his stick on it, deftly redirecting it into the U.S. net. American goalie Jonathan Quick managed to turn away 36 shots on Friday, but he never had a chance on that one. Unfortunately for Bylsma and his squad, he was right: The result was the same as the 2002 and 2010 Olympics, when Team USA couldn’t beat the Canadians when it counted. It would be unfair to the Americans to draw sweeping conclusions from just this one game, especially given how random a best-of-one series can be. But in a sport where mere inches can separate the victors and the vanquished, Canada’s best have routinely been better than their American counterparts. In the five times the teams have met in the Olympics since the NHL began sending its players, the U.S. has won only once—and that was a relatively meaningless group-stage game in Vancouver that Canada would go on to avenge in the finals. The Olympic series between the North American rivals now stands at 4–1, and not once over that stretch has Team USA finished above Canada in the final standings. If the Americans are Canada’s equals, they’ve yet to prove it on the international stage. The Americans will now face off with an always-solid Finnish team for bronze on Saturday. They’ll then watch along with the rest of the world as Canada takes on Sweden for gold on Sunday before waiting another four long years for their next chance to upend the North American pecking order. *Correction, Feb. 21, 2014: This post originally misidentified the player who had an early scoring chance for Team USA.